(Nanowerk News) Houston Methodist Research Institute scientists will receive about $1.25 million from the Center for the Advancement of Science in Space to develop an implantable device that delivers therapeutic drugs at a rate guided by remote control. The device's effectiveness will be tested aboard the International Space Station and on Earth's surface. Austin-based NanoMedical Systems Inc. and the Houston Methodist Research Institute (HMRI) are also supporting the five-year project, bringing total funding to $1.92 million. The Center for the Advancement of Science in Space (CASIS) at Florida's Kennedy Space Center announced new grants for Houston Methodist and two other institutions earlier today. "The prospect of developing and demonstrating a remotely controlled drug delivery implant excites us," said principal investigator and Department of Nanomedicine Interim Co-Chair Alessandro Grattoni, Ph.D. "If we are able to show the technology works in vivo and is safe, it could have an enormous impact on drug delivery and patient care." HMRI President and CEO Mauro Ferrari, Ph.D. is the project's co-principal investigator and will help supervise the project. The nanochannel delivery system, or nDS, delivers drugs at any rate. 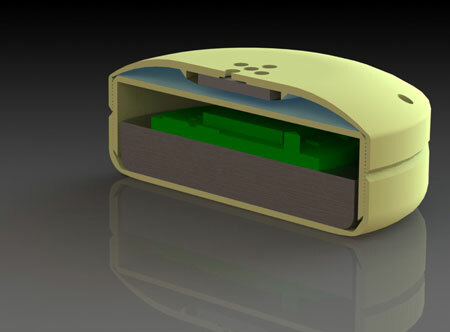 The 18 mm-wide implant shell (yellow) encases the drug reservoir (blue) and nanochannel membrane (grey area above reservoir), the electronic unit and radiofrequency antenna (green), and a battery (grey, bottom). On top of the nDS is the implant outlet (center top) and a drug injection port (top right). Grattoni's device, called a nanochannel delivery system or "nDS," is an 18 mm wide squat cylinder. It contains a reservoir for drugs and a silicon membrane housing 615,342 channels as small as 2.5 nm. The channels are sized and shaped to control drug release, and the exactness of the design is achieved using nanotechnology techniques developed by Grattoni and Ferrari. Drug movement through the channels is controlled by surface electrodes that "tune" the rate of drug delivery. Below the drug reservoir is a battery and electronics that can be activated to influence the rate at which drugs exit through the porous membrane. The electrodes are controlled via radio-frequency remote control. The device will be tested in animal models aboard the International Space Station. "Here the device will provide an agile means for controlling drug release where animal handling is extremely limited," Grattoni said. "Also, in microgravity, it will be possible to study the device in rapid and spontaneous models of osteoporosis and muscle atrophy." Studies on Earth in vitro and in animal models will examine the drug delivery system and the remote controlled drug release. "The nDS would enable telemedicine, reducing costs associated with hospitalization and travel for treatment," Grattoni said. "And in line with the CASIS mission, such technology could enhance other scientists' studies aboard the ISS. We also imagine other applications of the technology, such as military emergency care, pre-clinical studies of newly discovered drugs, and care for astronauts on long space missions." There are three technologies available today that allow a patient to receive drug infusions without having to visit a hospital or clinic. Among these are wearable, external pumps, implantable multi-layered polymers that release drugs as they erode, and implantable, metal-gated devices. In Grattoni's view, all three types of devices have limitations. External pumps may carry risk of infection around transdermal catheters and can be inconvenient. Drug-lined polymers may cause an initial burst in drug release and are not tunable once implanted. Current microchip-based devices may not be suitable for long term treatments -- despite their large volume, they have limited drug storage capacity. And there are a few reasons why doctors may want to have control over the rate of drug delivery. Some drug regimens are shown to work better or are better tolerated when delivered at regularly timed bursts, with rest periods in between. Also, the mix of hormones and other biological messengers changes in the body over the course of the day, and chronobiology studies by University of Texas Health Science Center at Houston environmental physiologist Michael Smolensky, Ph.D., and others have shown drugs can be more effective when delivered at specific times of day, say, only at dawn and dusk. Last, doctors may want to be able to stop or start drug delivery quickly in response to changes in patients' health. With Grattoni's nDS, this could be done remotely -- potentially saving time and improving medical outcomes for patients. "The nDS technology exists and has already been shown in earlier proof-of-concept studies to work quite well," Grattoni said. "Now we need to fully validate it in vitro and in vivo studies in advance of human clinical trials." Prior to the present CASIS award, Grattoni has been working in partnership with NanoMedical Systems Inc. to develop the nDS technology. "We began working with Dr. Grattoni and Dr. Ferrari over seven years ago, and we are now commercializing the first generation of constant release nanochannel technology with pharmaceutical companies," said NanoMedical Systems CEO and cofounder Randy Goodall, Ph.D. "We call it 'flying in formation,' as we provide the advanced electrode-activated silicon nanochannel chips to support Methodist leading this revolutionary next generation research and prepare to commercialize the results."